PORT MORESBY: Opposition Leader Don Pomb Polye today (Tuesday) set the record straight on infrastructure developments in the country. 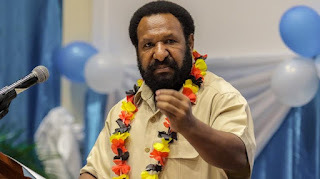 Mr Polye said the projects, which the Prime Minister Peter O’Neill had been officiating at to mark their openings respectively across the country, were solely the work of the Somare-Polye government. “So much have been said about the development projects countrywide during their openings in the public forums, including the mainstream media, but the fact on who was (were) responsible for all these remains misleading,” he said. He said on record the upgrading of impact projects like the Jacksons International, Hoskins, Kagamuga, Gurney and Tokua airports among others was funded by the past government through the Asian Development Bank. Polye added the past government was also funding the other major transport infrastructure developments, particularly the regional wharves and highways. “The only projects the current government funded are in NCD alone under the pretext of international events,” clarified Mr Polye. He said the credit should be given to where it was due. He thanked Civil Aviation minister Steven Davis for clarifying that he (Polye) was the man responsible for these projects. He said these projects derived from the past government’s Export-driven Strategy which set the economic foundation of the country. “He (O’Neill) is yet to implement his own development programs as he has been running the country haphazardly,” a furious Polye said. He added the O’Neill government was good at spending only and not at making money for the public purse. “Most of the projects especially in the nation’s capital are not economically justifiable. “Unequal distribution of resources and wealth has taken precedence over at the expense of those provinces which contribute enormously to the government’s revenue basket,” he said. He said he doubted that the so-called infrastructure developments in the nation’s capital would add economic value to the country’s economic growth. He described the current development strategy undertaken by the current government as one-sided and unbalanced. “We are not on track. The challenges to improve the livelihood of our people are still outstanding. “Our global development indexes have been worsened and yet no efforts have been exerted by the government to arrest them,” he said. He cited among others PNG’s global corruption index was among the worst. He has queried whether how the future of the country was on track when the development challenges still remain unaddressed.